Cherry Ames is on the case again, and per usual, the mystery is wrapped up in the medical field. 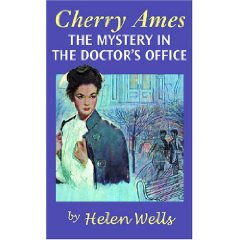 In Cherry Ames, The Mystery in the Doctor's Office Cherry has just taken a job at a doctor's office in New York. There are three doctors in this general practitioner's office, a lab tech, and an office administrator named Irene Wick. Cherry is replacing a nurse who left under mysterious circumstances that no one is willing to tell her about. She's curious to know why but her professional attitude will only allow her to ask so many questions at one time. Making friends with the younger doctor in the firm, Dr. Gray (who is naturally young, handsome and interested in Cherry), Cherry begins to question some of the practices regarding patient payments which are being made. Her curiosity (and desire for a well-run, professional office!) causes her to start questioning the way that Mrs. Wick handles funds and keeps track of the doctors' accounting records. Is there something fishy going on? Well. Yes. It is The Mystery in The Doctor's Office after all! This isn't my favorite of the Cherry Ames books because I think Cherry comes across as being more stuffy than kindly concerned about others. That said, it did provide a pretty strong mystery and I was entertained throughout the book. It's the next to the last book in the series and aptly titled, in my opinion. As is to be expected from the Cherry Ames books, the job at the doctor's office is going to come to an end because Cherry has new adventures waiting for her in other locations. The next place we find Cherry is on the ski slopes in Switzerland. She is now (dun dun duuuuUUUNnnn!!!) 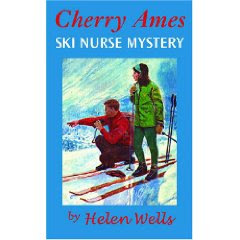 Cherry Ames, Ski Nurse . (Do you like how I got that link in there? Crafy, eh?) Cherry has accepted a job on the ski slopes and is helping a doctor tend to broken bones suffered by people who don't know how to ski. This book probably contains the best mystery of the series, in terms of my lack of ability to figure out what certain mysterious characters are up to. On the flip side, this is also the most poorly written of the Cherry Ames books. I'm not sure why the series stopped at Book 20, however, it is quite obvious that the writer of this particular title (Julie Tatham) is bored, bored, bored. It's not that she didn't tell a good story because she did. She just didn't write it very well. There is a definite feeling that she has grown lazy in the mechanics of writing out her thoughts. This was a somewhat disappointing way to conclude the series for me, but I'm not at all sorry that I read it. I just might suggest to any of you who choose to read through the series, that you pretend Book 19 is the end. On the whole, I'm very glad to have spent some quality time with Cherry, catching up on her adventures at this stage of my own life. It's good to spend time with old friends (which is something I know I keep saying but it's true)! 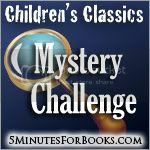 Of course, this post is being linked up to the Children's Classics Mystery Reading Challenge happening over at 5 Minutes for Books (and where I've been visiting with lots of other friends as well!) Still a few months of fun left if you care to join in! I'm not sure I'll have time to read Cherry Ames for the challenge. I might have to pick her up later. I haven't read any Cherrie Ames. Oh, I so agree with you about spending time with old friends. It is delightful.